A highly pathogenic form of coccidiosis, caused by Eimeria necatrix, in which the parasite is present in the small intestine and in the caecum. It occurs in chickens worldwide and has variable morbidity but mortality is high in severely affected birds. Petechiae and thickening, of middle to posterior third or more of small intestine. Schizonts seen as white spots through the serosa interspersed with petechiae. Deep scrapings necessary to show large schizonts. Oocyts in caecal scrapings. Signs, lesions, microscopic examination of scrapings Differentiate from necrotic enteritis, other types of coccidiosis. Coccidiostats in feed, vaccination, hygiene. This is one of the less immunogenic species, commercial vaccines commonly contain more than one strain of E. maxima. Figure 14. 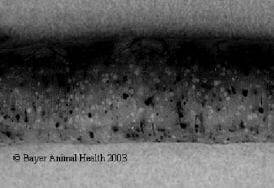 Moderate Eimeria necatrix infection in the jejunum of a chicken (Score 3). In this case the intestine is thickened and can become ballooned and sausage-like. Haemorrhages and white spots are visible from the outside of the intestine.